San Diego Comic Con is right around the corner, which means the Eisner Awards will soon be announced! Taking place on Saturday evening of Comic Con weekend, the Eisners are voted on by comic professionals and are one of the most prestigious honors a creator can receive. Many of us that cannot attend SDCC will enjoy an exciting, but somewhat sad evening following the announcements of each winner on Twitter. 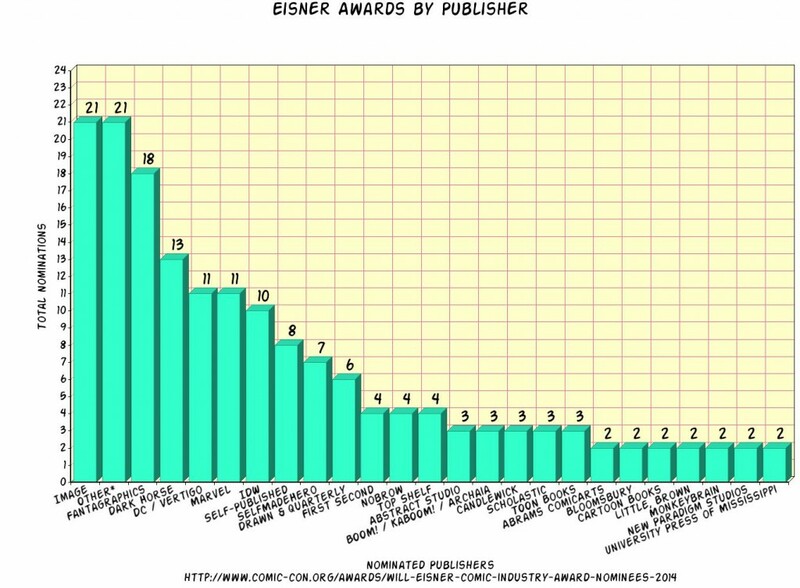 So much of the focus leading up to the Eisners understandably surrounds the content, but we decided to take a closer look at the nominations by publisher and by gender. Awards are often disregarded as being unimportant, or simply an opportunity for pros to give each other pats of the back. 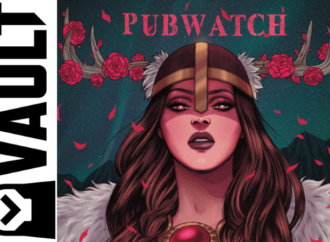 They are significant in what they represent, and that is what the comic industry considers the best of the best; the face of the industry is reflected in these nominees. We have a few graphs to explore and will also explain our methods for counting nominations along the way. 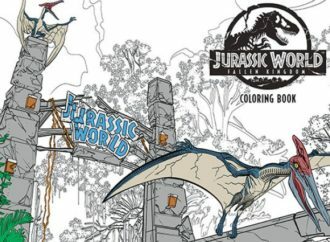 For nominations by publisher, every category and nominee of the Eisner awards was counted, including the numerous works associated with Best Coloring nominees. 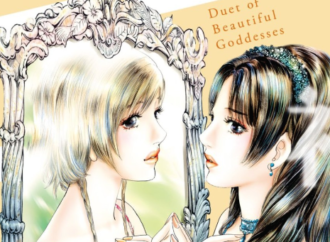 Digital and webcomics that were not associated with a publisher were counted as self-published. Nominees in Best Comics Related Periodical/Journalism were only counted if they were physically published (The Comics Journal released by Fantagraphics was the only one to meet this criteria, though their website, which was also nominated, was not counted). Twenty-one publishers who received one nominated work each were combined into one category (other) to reduce the size of our graph. They are as follows: Annick Press, Bongo, Canton Street Press, Chronicle, Desert Island, Fanfare/Ponent Mon, Graphic Universe/Lerner, Groundwood, Koyama, Last Gasp, McFarland, Norton, Oily, Pantheon, PictureBox, Sunday Press, Tinto Press, Titan, Uncivilized Books, Valiant, and Vertical. Clearly the last year has been a financial and critical success for Image Comics as evidenced by their impressive twenty-one nominations. For nominations by gender, a few categories were not counted. Best Comics Related Periodical/Journalism was not included. Since most of these sites are comprised of large teams of contributors, we felt it would not accurately reflect the gender of the content creators to only count the named editors. Best Archival Collection/Project—Strips and Best Archival Collection/Project—Comic Books were also left out since the purpose of analyzing this data is to determine the state of gender representation amongst nominated creators from the last year. 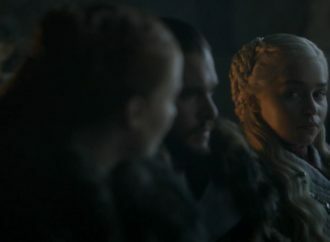 In order to keep the focus on comic creators, we did not include writers of the original source material for the Best Adaptation From Another Medium category. 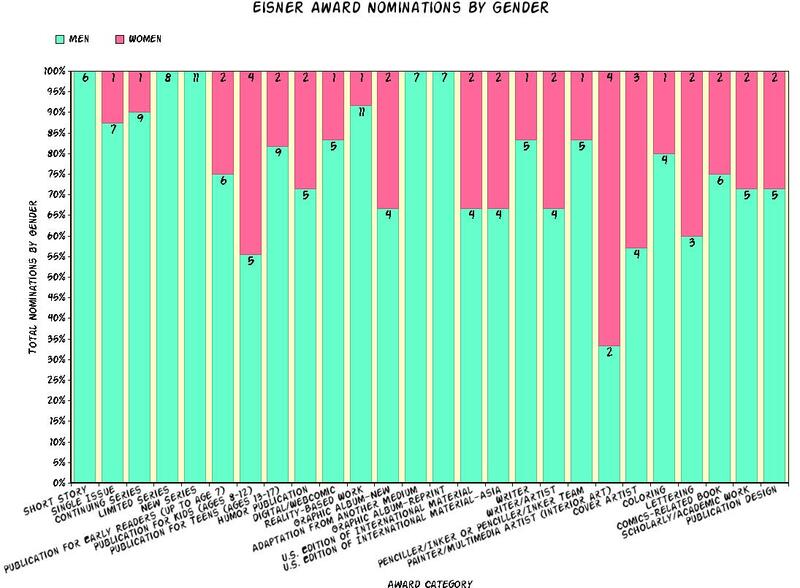 There are only a few categories where men and women are close to equally nominated, and shockingly several major categories were devoid of any women. These include Best Short Story, Limited Series, New Series, Graphic Album Reprint, and Adaptation From Another Medium. One category has women outnumber men as nominees—Best Painter/Multimedia Artist (interior art). Best Digital/Webcomic may have the most surprisingly low number of female nominees. 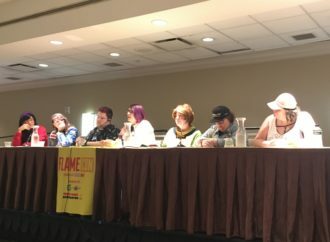 This category is still rather new and the panelists deciding the nominees may be more familiar with traditional comic media, but it is still a glaring omission considering the diversity and quality amongst webcomic creators. 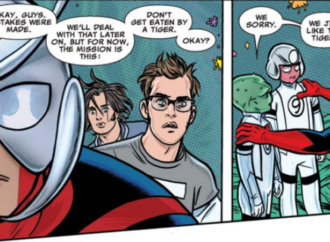 For instance, consider the sad fact that E. K. Weaver’ The Less Than Epic Adventures of TJ and Amal will never be nominated for an Eisner after having recently ended its six year run. 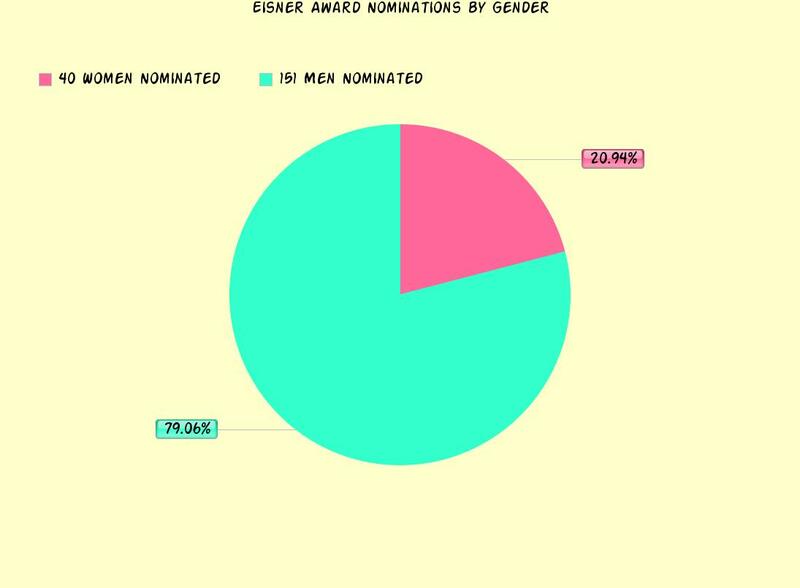 Looking at the nominations regardless of category shows that women make up 20.94% of the nominees. 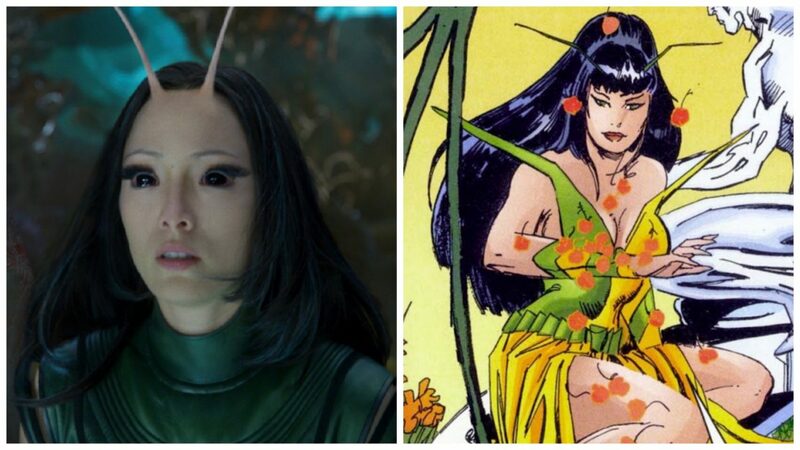 This is probably still better than past years, but we look forward to seeing more female creators gain accolades as the industry welcomes more women as creators, readers, and subjects. To further explore the nominated works and creators, here is the full list of this year’s nominated works (and our resource for creating these graphs). What books and creators do you feel were overlooked this year? What are you hoping will win?